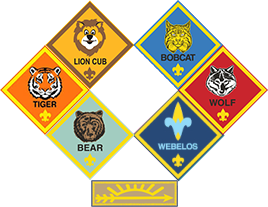 To earn the Wolf rank a Cub Scout must complete 58 tasks (out of a possible 74) that are offered along the Wolf Trail. Your scout will need to purchase a Wolf Handbook (cost is $8.99) to begin his trail. Below is an outline of the material covered in the handbook.